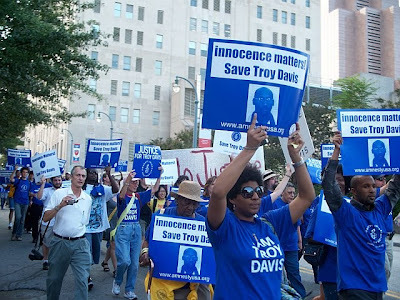 The Urban Politico has partnered with the Black Bloggers Connect to host the Blogging for Troy Davis Conference this weekend, beginning today, as well as a twitter forum Sunday, 7pm-8pm est, highlighting the Troy Davis case. There will be blog posts featured from around the world that have been written regarding the Troy Davis case and controversy. We are encouraging all our readers and supporters to join us this weekend via the BlackBloggersConnect.com homepage, as well as on twitter by following @urban_politico and @bloggersconnect and joining in on the discussion. You can also join the Urban Politico chat homepage and chat with us about the case and the forum as well. There are also a number of online petitions circulating which we encouraging folks to sign as well. One is on the Amnesty International and there is also one on Change.org. Lastly if you have a website and would like to be part of this conference email info@BlackBloggersConnect.com. With only a few more days left before the execution of Troy Davis it is imperative that we pull together every resource possible to try and stop a tremendous injustice from occurring in the name of justice. If it was me or a family member I only pray that I can not only garner this kind of support, but that in the end it would actually make a difference. Faith is believing that what we are doing right now WILL make a difference, even though we have no tangible evidence to support the feeling. Allow your faith to stand with us. All we are asking is for you to sign a petition and allow your presence online to be felt this weekend. In approximately ONE (1) week an innocent man will be be murdered by the state of Georgia. For 20 years this man and his family have been fighting a system of racism and corruption, eventually receiving a verdict of death from the same pit of evil. I decided not to do much writing on this subject and let what has already been done and said on the matter speak for itself. I believe that most of you, our readers, already know who Troy is and what is going on with the case so this is not to inform you - it is to inspire you to take action. Davis, convicted of the 1989 killing of an off-duty Savannah police officer, has steadfastly maintained his innocence. In the decades since his conviction, his case has become somewhat of a cause célèbre, with former President Jimmy Carter, Archbishop Desmond Tutu and even Pope Benedict XVI, among others, urging the courts to grant Davis a new trial. Advocacy groups rallied. Letter-writing campaigns were launched. In 2009 Davis, by filing an original writ of habeas corpus with the U.S. Supreme Court, convinced the justices to order a federal court in Georgia to look into new evidence that he said would establish his innocence. Earlier this year the Supreme Court turned down what likely was Davis' last set of appeals. Some of the witnesses in the case against Davis have recanted their testimony. Even with that evidence, Judge William T. Moore Jr., the trial judge, concluded that Davis' evidence was "largely smoke and mirrors" and ruled against a new trial. Davis will be put to death at 7:00 p.m., two Wednesdays from now. Davis' fight for his life continues. The only thing that can save him from his fate at this point is a pardon from the governor. Knowing the state of Georgia, that isn't coming. If the prison system kills a man who at best is innocent and at worst may be innocent, then it will prove what we already know: The system is flawed and does not value the very lives it claims to protect. For the entire two years I was in jail awaiting trial I wore a handmade cross around my neck, it gave me peace and when a news reporter made a statement in the local news, “Cop-killer wears cross to court,” the cross was immediately taken as if I was unworthy to believe in God or him in me. The only time my family was allowed to enter the courtroom on my behalf was during the sentencing phase where my mother and sister had to beg for my life and the prosecutor simply said, “I was only fit for killing.” Where is the Justice for me, when the courts have refused to allow me relief when multiple witnesses have recanted their testimonies that they lied against me?